Perfect Pollinators is a ground-breaking science based project about Red Mason Bees for Key Stages 1 and 2 pupils. Managed by the South East Education Group (See Nature, Schools Bird Box Project) and Naturequest, every school in the project will be provided with a webcam bee house, a colony of Red Mason Bee cocoons and a meadow seed pack so that pupils will have the opportunity to watch the incredible sight of the female bees pollinating plants on the school grounds, working and laying their eggs in the bee house, the larvae growing and building their cocoons, and the cocoons hatching the following spring as the life cycle starts again. Perfect Pollinators 2018 Buzzline 6 Why are our bees in danger? Perfect Pollinators 2018 Buzzline 5 Why are our bees in danger? Every school in the project will receive a webcam bee house, approximately 15 Red Mason Bee cocoons and a pack of wild meadow flower seeds. Our team will visit your school between October to January to fit the bee house on an outer facing wall, place the cocoons and configure your live stream. Following this visit, your pupils will create a meadow flower garden in your school grounds in advance of the bees exiting hibernation. From the end of March to the start of July, your pupils will be able to watch the incredible sight of the bees pollinating plants, and the females working and laying their eggs in the bee house. The larvae will hatch, feed on pollen left by the females and create their cocoons, ready to begin their news lives the following spring. All captured live in your webcam bee box. At the end of the summer term, our Team will visit your school again to remove your excess bee coccons from the house. The cocoons left in the house will then hibernate ready for the cycle to start again the following year. A stunning video from our friends at Team Candiru. Registeration to the Perfect Pollinators 2019 project is just £199+VAT for the whole school, for the year. This includes live streaming from your webcam bee house, dedicated support from the project team, membership to the project website, and access to the Spring / Summer education programme. 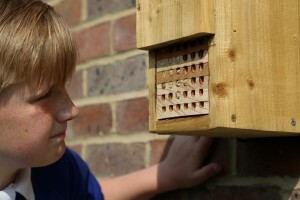 The webcam bee house package is just £189+VAT, which also includes approximately 12 x red mason bee cocoons and a pack of wild meadow flower seeds. We also offer an optional installation service to get you up and running. Installation prices (depending on location vary from £159 to £179 plus VAT. If you would like to register for Perfect Pollinators then simply download, complete and return the Perfect Pollinators 2019 Order Form to info@seenature.org.uk (or by post). On receipt of your order form your school will be contacted by a member of our Team to discuss the next steps. If you would like to find out more about the project, then please contact us at info@seenature.org.uk.